It’s done, it’s done, hooray and whew. I added some non-Liberty prints in the mix, just for dimension. Holler if you need an ID on any of the prints! 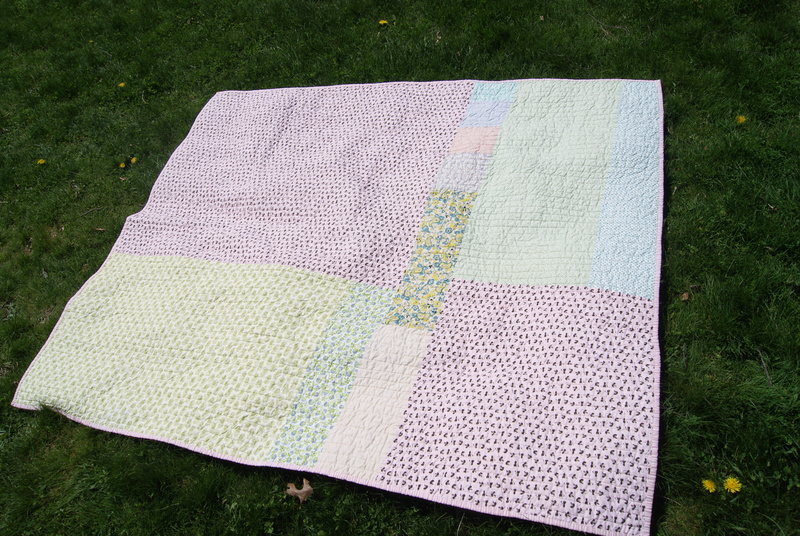 I quilted it in a free-motion wonky square pattern. 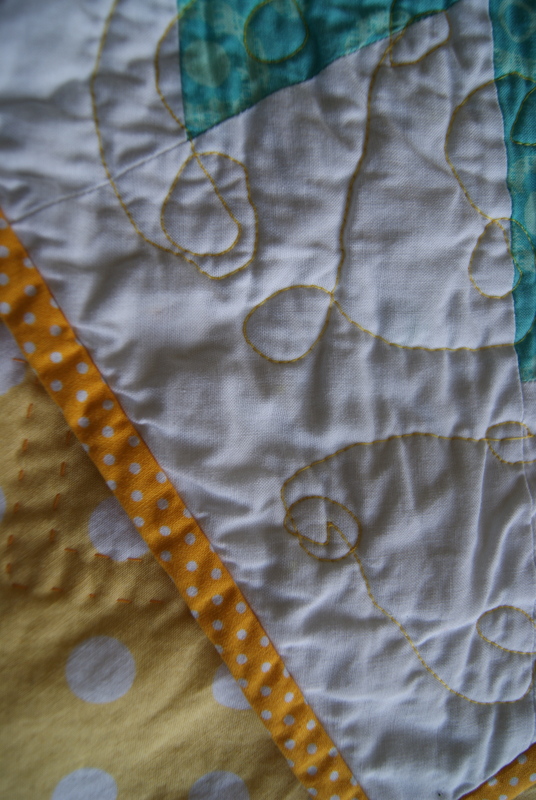 I think my free-motion quilting is truly improving. For awhile, I really felt like I was going to stink at it forever–but this time I sat down and just did it, and it felt so much more natural. I bound it in the charcoal Madrona Road Memoir print. I’m especially proud of the back of this quilt. I backed it with an Amy Butler print from Cameo. 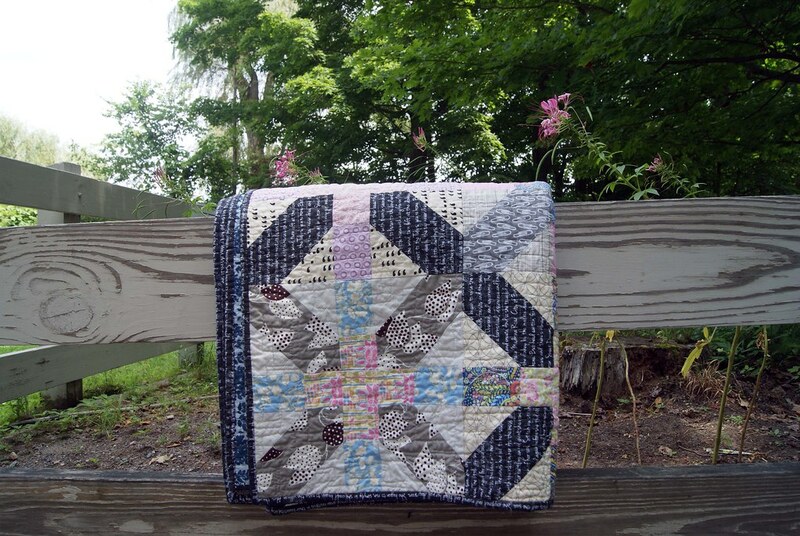 I love the blue-grey colors with the greys and pastels of the front of the quilt. When I bought it on 50% off sale at FQS, I dumbly and blithely bought 3.5 yards, which is almost always what I auto-pilot buy when I am buying quilt backs. Of course, not enough for a 72” square quilt. I think I managed brilliantly. Looks intentional, right? The romantic story of the Memoir print plays out in the Amy Butler print, framed by some pretty sweet Liberty florals–like all these fabrics were meant to go together. If you’re looking to do your own x-plus quilt, I used Amy Badskirt’s tutorial but cut sizes from this pin to make 12” finished blocks. I made 36 blocks, 6 x 6. A few photos to prove that I’ve finished this beast, yes? At 64” x 84”, if this isn’t the biggest quilt I’ve ever shoved through the Janome, it’s definitely close. 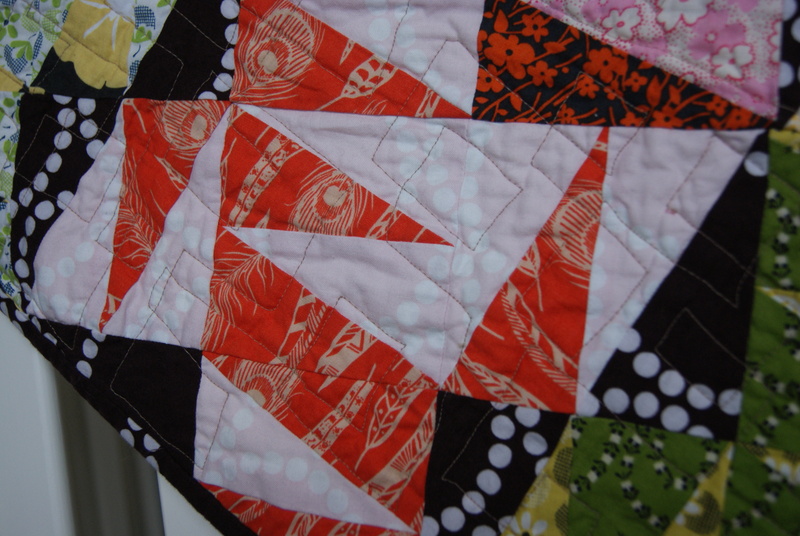 You can see the straight-line quilting a bit better here. 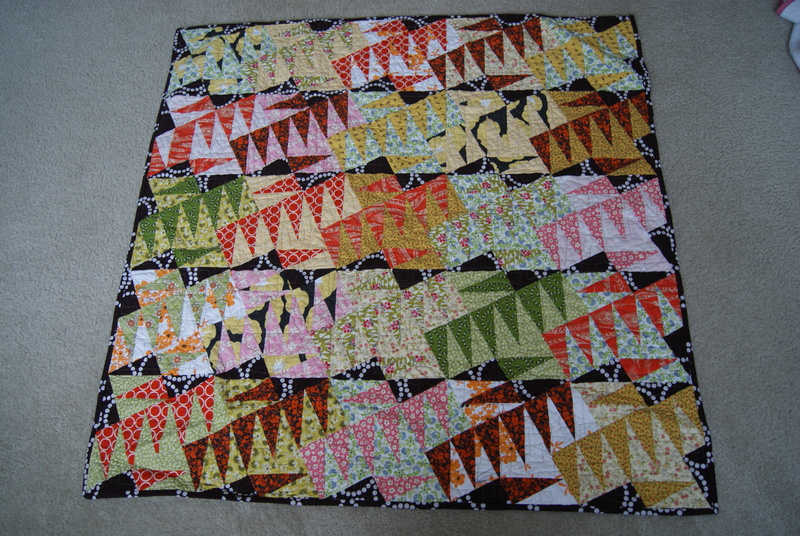 I chose to follow the pattern of some of the zigs, rather than just go up and down the quilt. It turned out okay, but there was some teeth-gnashing as I turned those corners, and got folds of fabric caught under the walking foot filling in middle spaces. And good news for my husband, who has to move all these quilts this winter (we ARE moving out of this tiny apartment, no matter what! ): I am giving this one away. Yep. 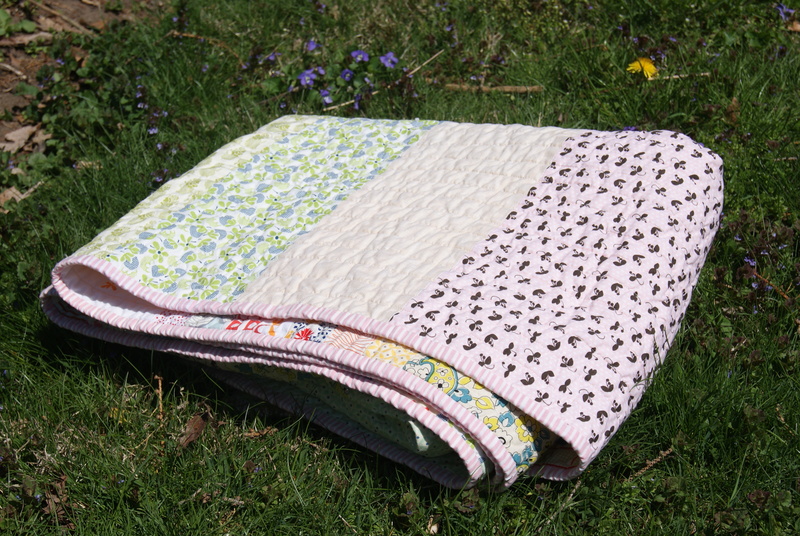 My professor friends who live in Phoenix have only a very small throw-size quilt that I made in my early quilting days (completely hand-pieced and hand-quilted, hand-sewn binding and all). He is very tall, and I felt so sorry when they sent me a photo of him trying to nap under the little quilt. He definitely needed a bigger one. And they needed one that both of them could snuggle under! Their anniversary was ten days ago, and her birthday is two days from now, so a perfect excuse. 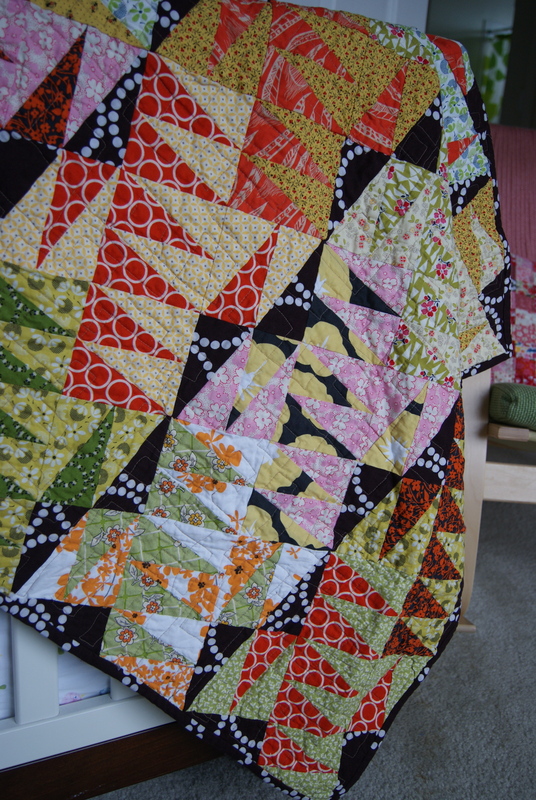 I backed the quilt in scraps. 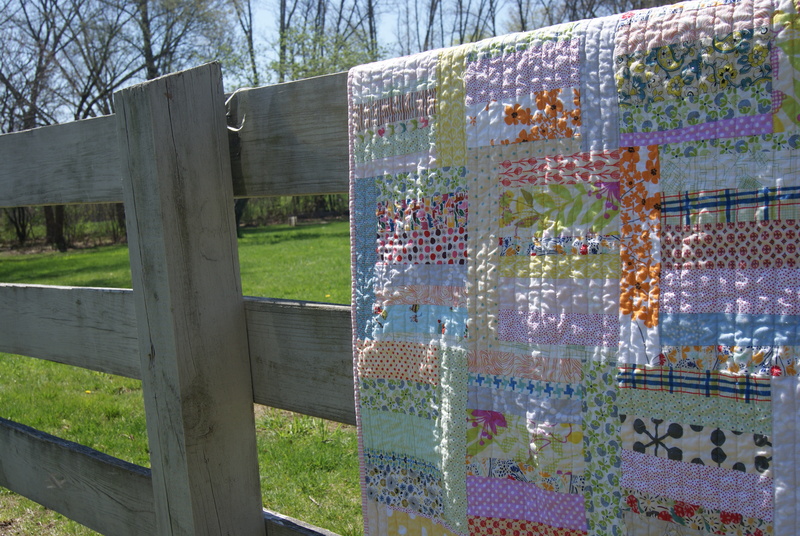 The spirit of a scrap quilt is “buy nothing new,” yes? I tried to carry the rainbow idea onto the back. The other side is sky, sun, grass, earth. 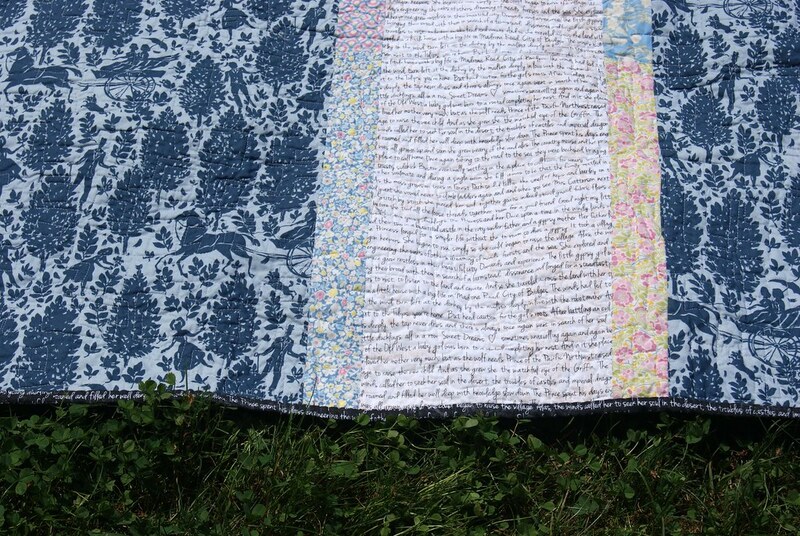 The quilt is bound in the white Memoir print from Violet Craft’s Madrona Road, which I have now stashed and re-stashed. Now I need to re-re-stash it. Ha! Thanks again for putting up with so many photos of this one. I’m proud of it–but I’m MORE than ready to bundle it into the mail and move on to the next thing! Onward! Warning: so many pictures ahead. After an awful Feb-April, this week we have finally been blessed with weather so beautiful as to almost be obscene. 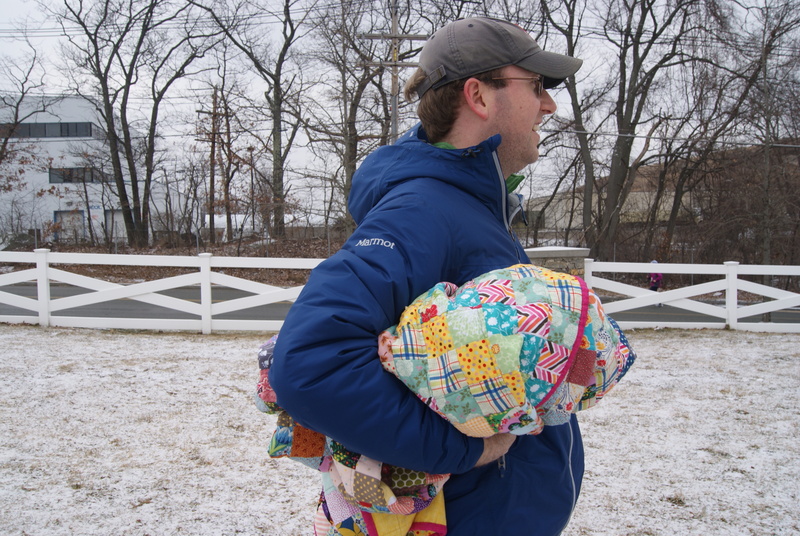 and headed to Endicott Park in Danvers for a real outside quilt-photo session. I made this quilt to be a wedding gift for either my cousin or my little sister’s childhood best friend, both of whom are getting married on June 29. I figure I’ll make two quilts and get my mom and sister to help me decide who gets what. 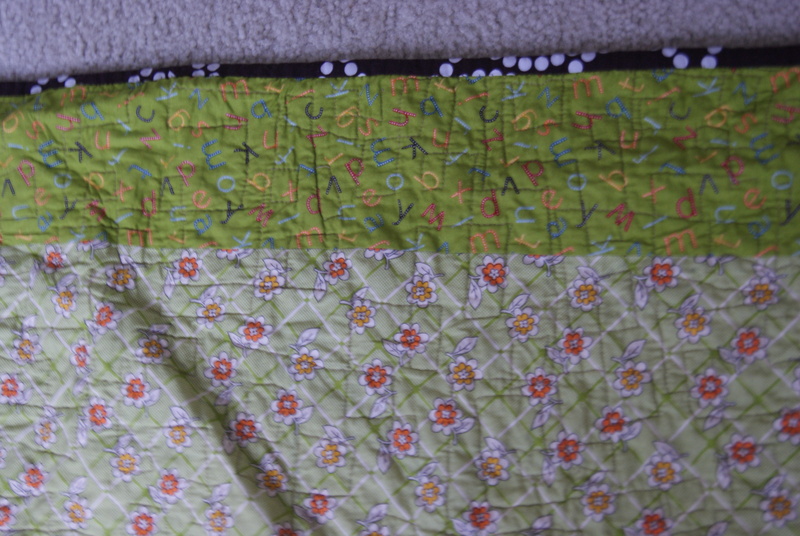 Even as I sewed down the binding last night, I had doubts: is this quilt too scrappy to gift? 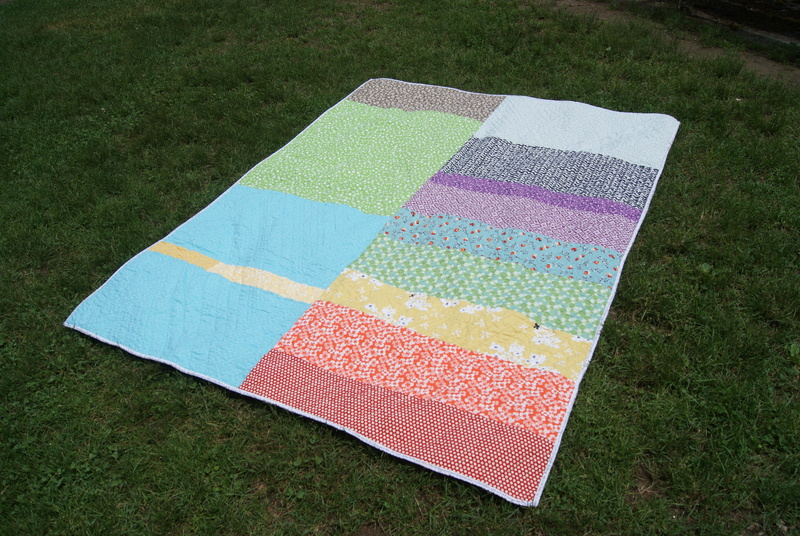 (How DO we feel about gifting scrap quilts? 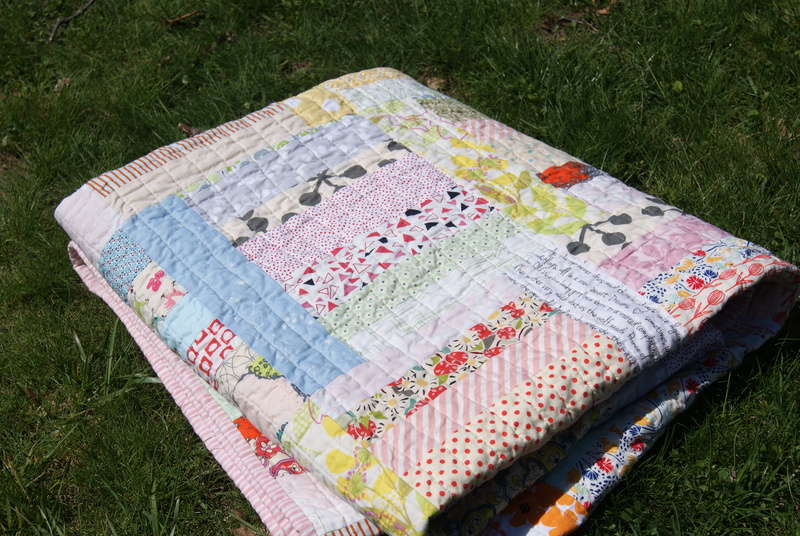 Do you gift scrap quilts, or do you only gift “special” quilts?) 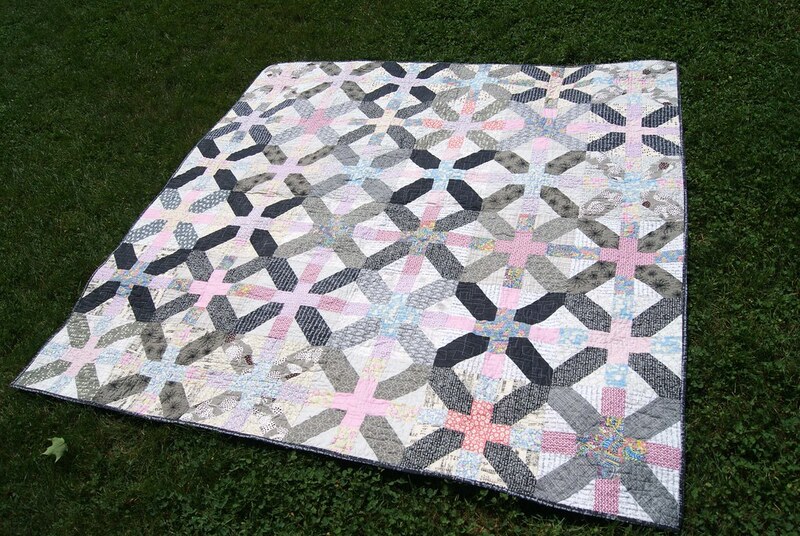 Is it a quilter’s quilt, in that only someone who’s looked a lot of quilts will appreciate its low-volume gorgeousness? Is it too modern? But these pictures of the quilt spread out on the green, dandelion-spotted grass did it for me. 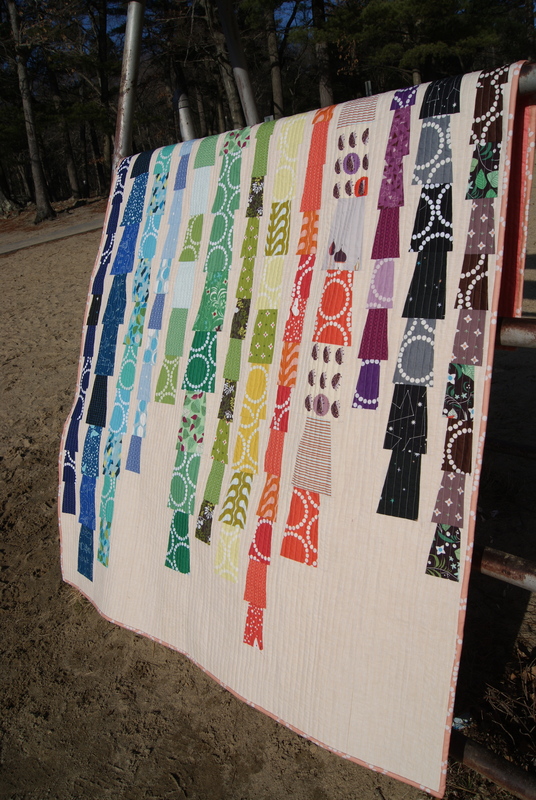 If I saw these pictures published by anyone on any blog or on Flickr, I’d covet this quilt. I’ll trust that one of the brides-to-be will, too! 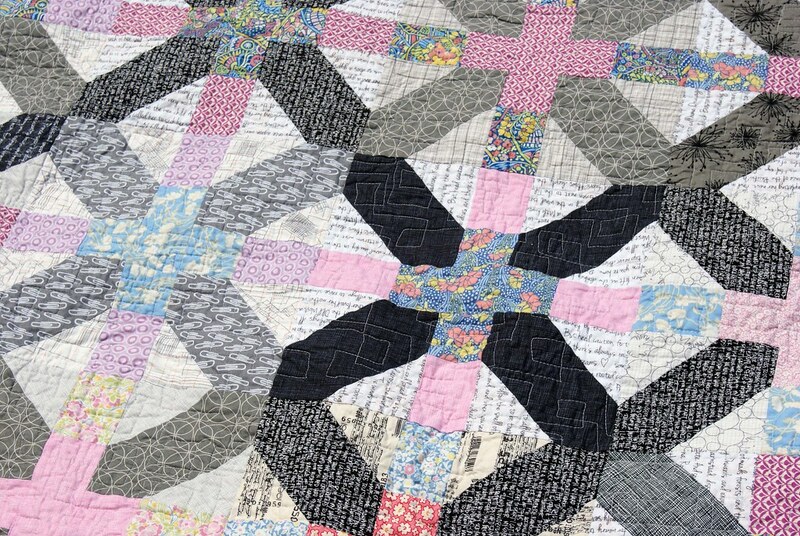 Pattern: Cheryl Arkison’s Sunday Morning Quilt, published in Sunday Morning Quilts (Nyberg & Arkison, 2012). Blocks constructed as written, but I did 6×7 blocks to make a throw size, ~60”x70”. Fabrics: all kinds of low-volume scraps and stash from just about every place you can buy fabric. The big pieces on the back I scored from Pink Castle Fabric’s Sale section (swoon) and were like less than $5/yard. 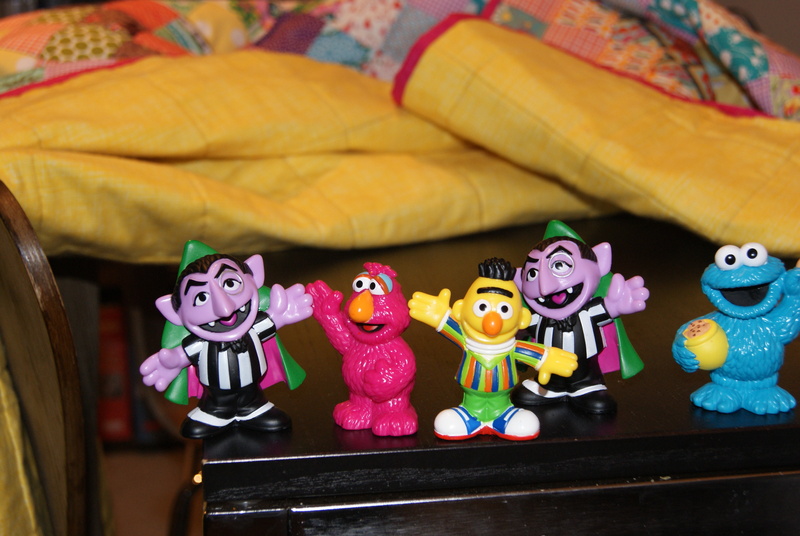 (Marked down to $5, and they were running one of their super-awesome 20% off any purchase promotions.) The binding was also from the PCF Sale section, though it was slightly more than $5/yard. It’s a print from Simpatico, I believe, and was a perfect frame for this quilt. 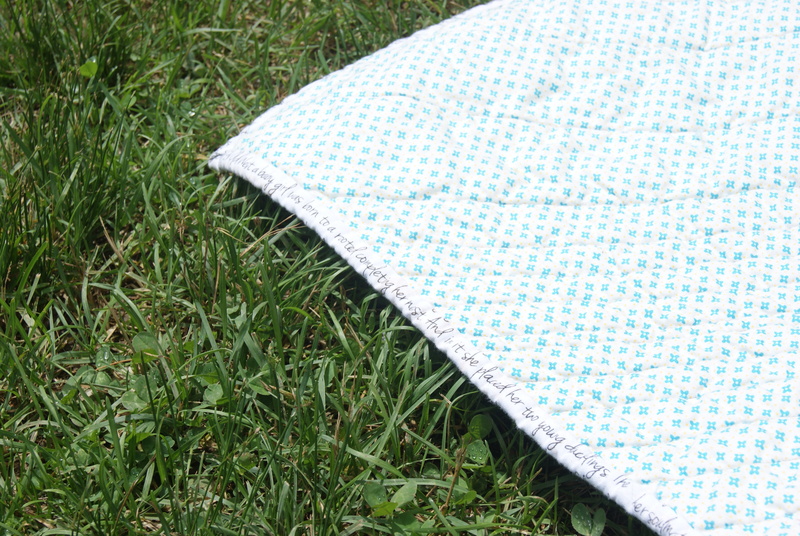 Quilting: is just more straight-line quilting, .75” apart. I actually used that weird measure bar thing this time. I’m not crazy about that little bar, but it allowed me to make my lines further apart. 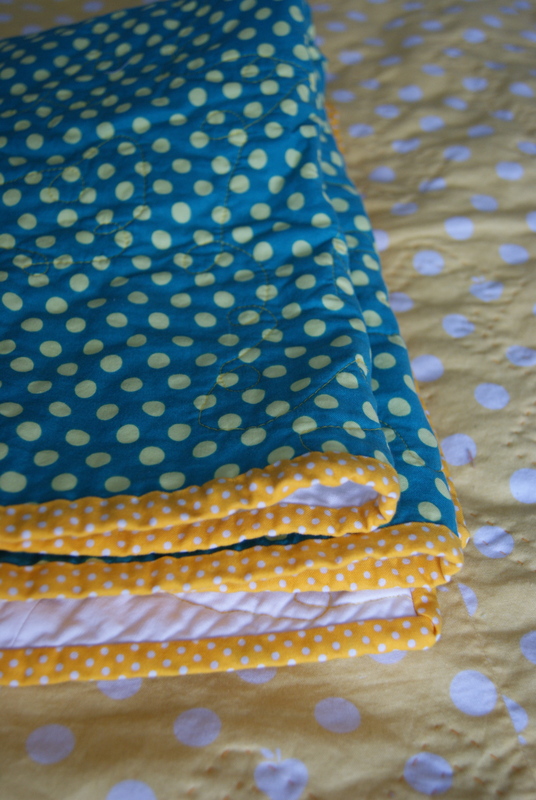 Quicker quilting, a softer, drapier quilt. 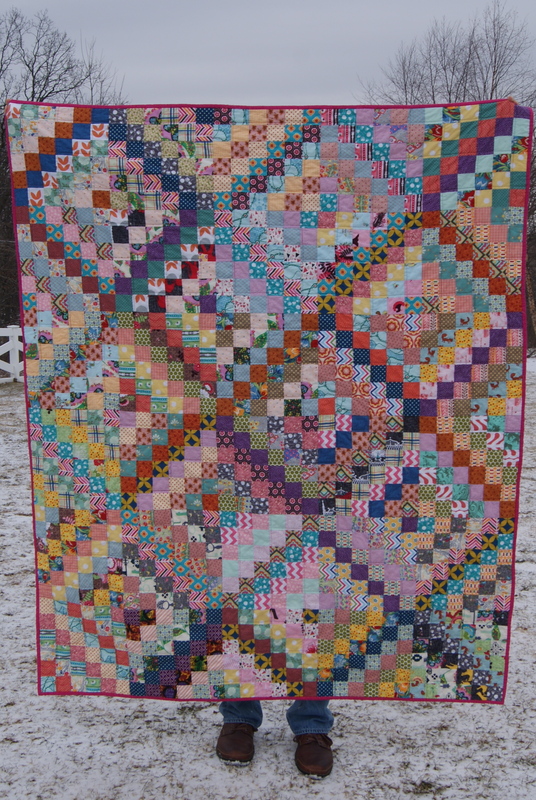 ETA: also linking up to Rachel’s Festival of Strings, as this was a string quilt I finished in 2013 (started after she announced the contest idea, so I feel definitely on the up-and-up)! Oh, you know I could blather on, but all we really care about is the pictures, right? 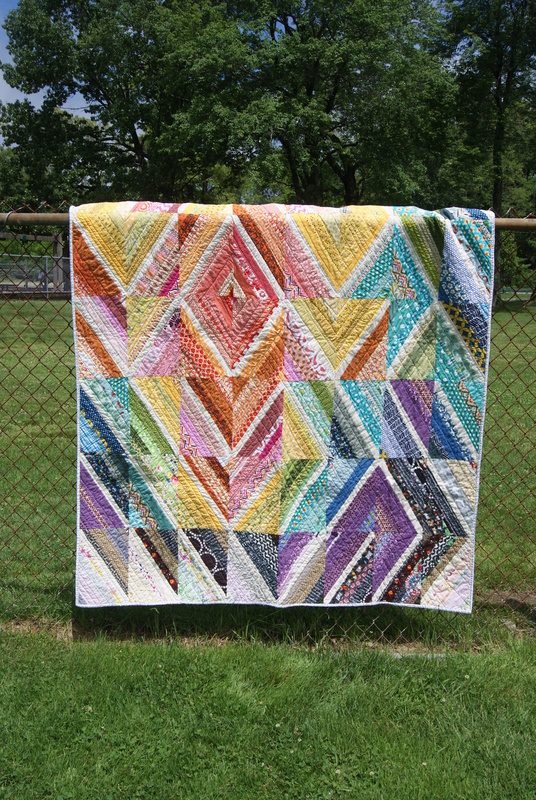 Pattern is Glam Garlands by Elizabeth Hartman, published in her book Modern Patchwork. There are 48 (!!) 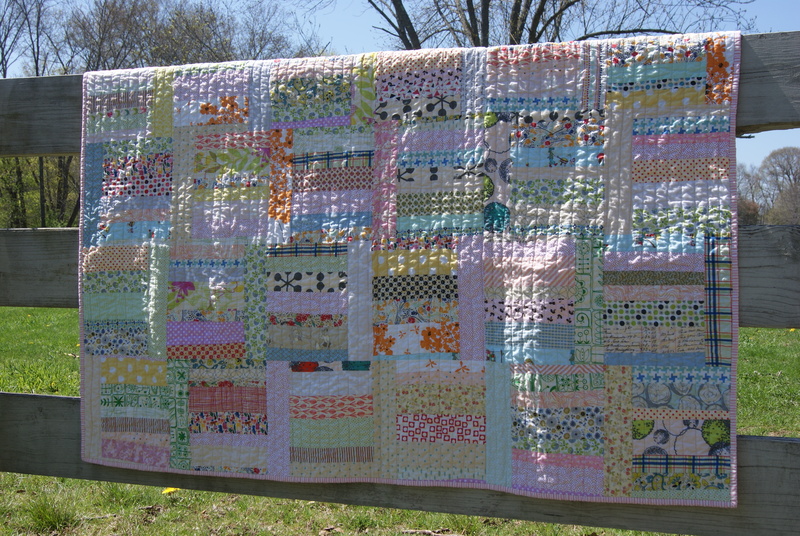 different Lizzy House fabrics in this quilt. One final brag, and then I promise I’m done. When we took this out on our walk at Breakheart Reservation today, Nate handed me the camera and asked me to check his quilt photography. “Make sure you get a really good picture of this one,” he says. “You should be proud.” It’s great when someone who doesn’t give two hoots about quilts notices and compliments your hard work, huh? Yeah, so, I’ve been on a roll. 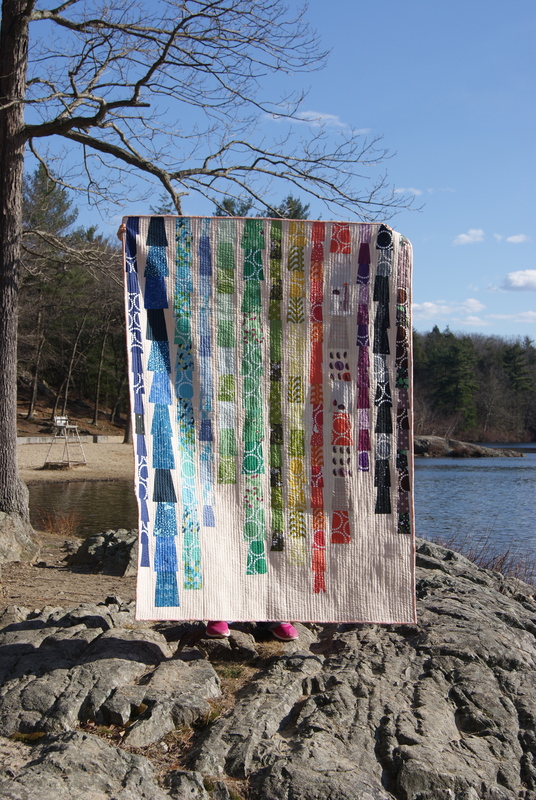 This little lovely came together so quickly with the help of a Twister ruler, and Aimee of Salt Marsh Designs, who taught the Seacoast Modern Quilt guild how to use a Twister or a Mini Twister at our February 2 meeting. I spent longer digging in my fabric pile than I did piecing this. But I’m still pleased with this little project. I love the colors. This deep into winter, I start craving bright colors that I can almost taste. 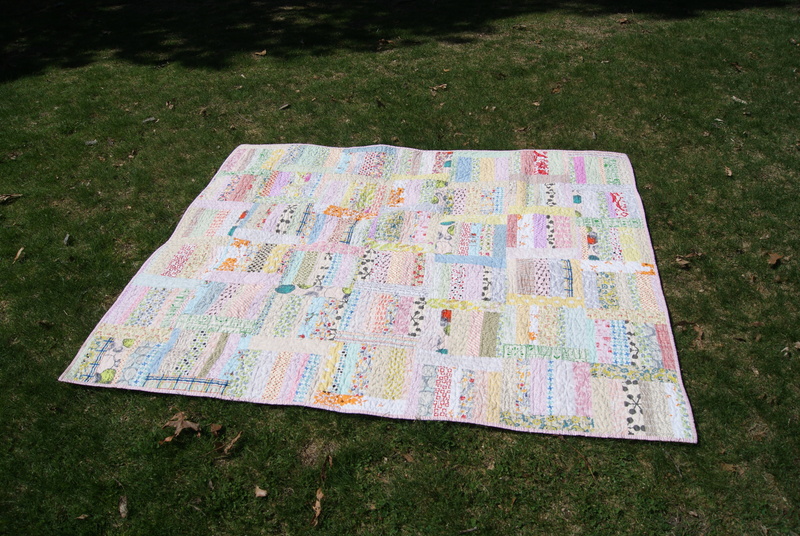 It is a baby-less baby quilt. I don’t have any friends who are pregnant right now, which is a little weird. I’ll put it in my pile and wait for someone to need it, or else I’ll donate it after it’s hung around for a few months. 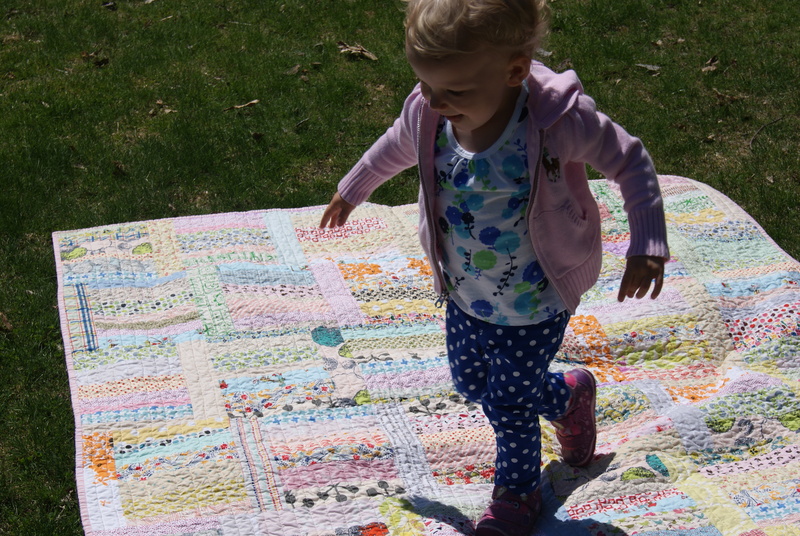 This project was so quick and fun, that there may be more Twister quilts in my future! Warning: after three-ish weeks of not posting any real content, I’m about to overload this post with pictures. So, if you’re faint of heart, opt out…now. Quilt #1: The Mother-in-Law quilt Back in October, I started what I knew would be one of two Christmas gift quilts: my rainbow Fire Drill quilt, pattern from Elizabeth Hartman’s Modern Patchwork, color plan inspired by totally copied wholesale from this pin. Again, I reiterate, I COPIED this color scheme. I didn’t come up with it on my own! I wish I’d had the smarts, but I’ll take this quilt however I came by it. Because it’s gorgeous. Piecing this one went quickly and fairly easily, though if you look closely, I had some moderate troubles making my diamond points meet. This is a shrug-and-move-on trouble, though, because when you pull back, all you see is glorious color. 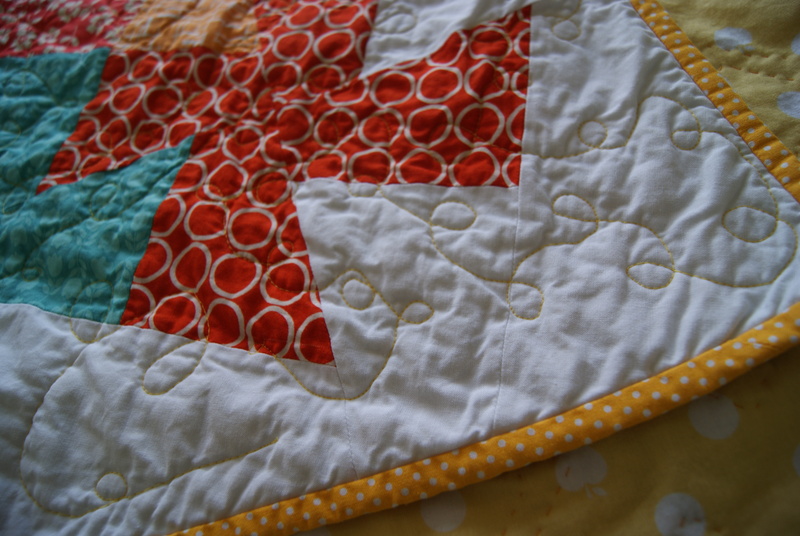 And when you look closely, all you see is lovely texture, from hours and hours of careful outline hand-quilting. 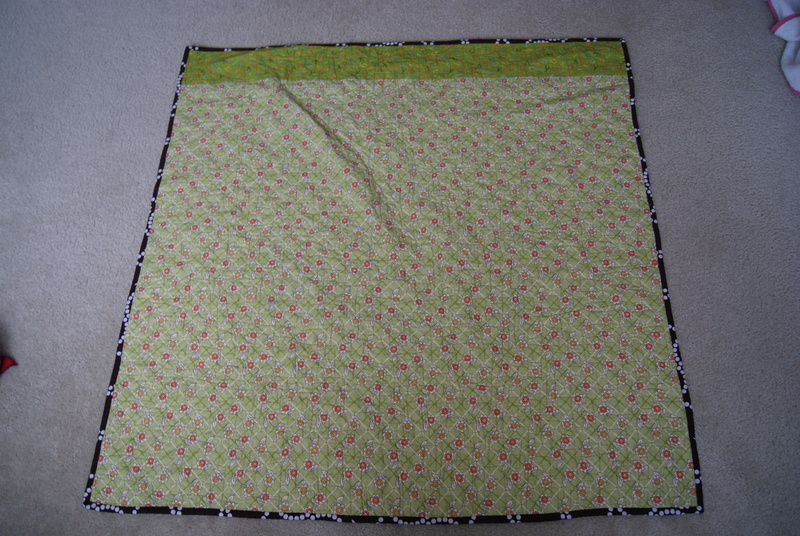 With Gutermann’s handquilting thread and a #11 Black Gold quilting needle, natch. 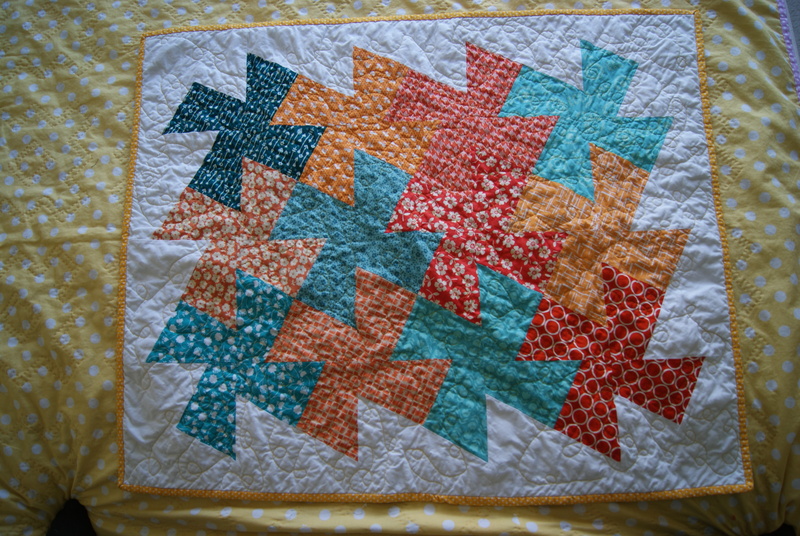 This is also my first ever pieced-back quilt. I love, love, love it. Scraps from the front to make spectrum “drips” across the back. The neutral is actually a sand-and teal colored dot from a Riley Blake line that I picked up on clearance. It’s perfect. Quilt #2: The Momma quilt It wasn’t quite fair to make a quilt for my MIL when I’d never made one for my own mom. 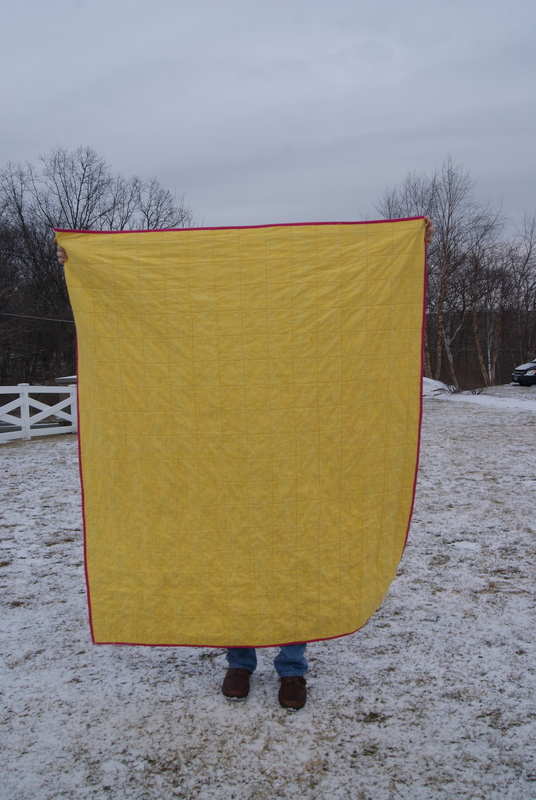 My mom quilts, though she has primarily sewn garments. 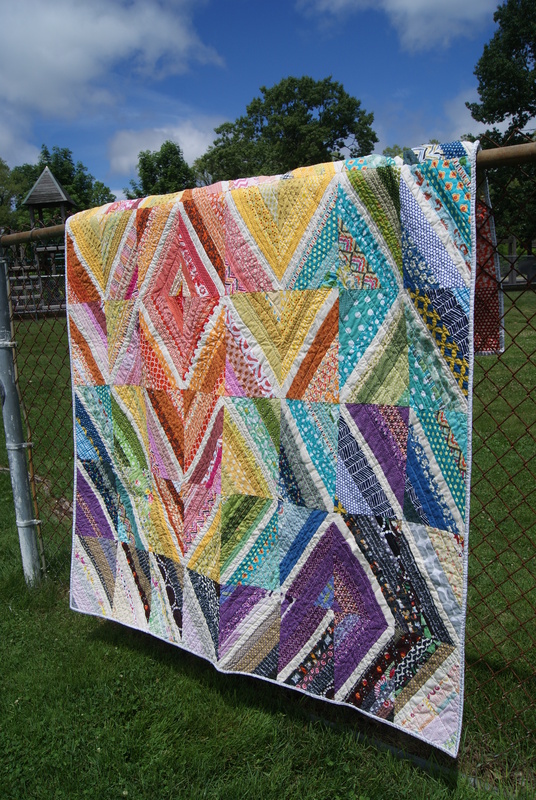 When I first started quilting she gave me a HUGE box full of pre-cut scraps to start with, including about 500 axe-heads that I hand-pieced into a queen-sized monster. As my second quilt project. Ahem. Needless to say, I owed her one. 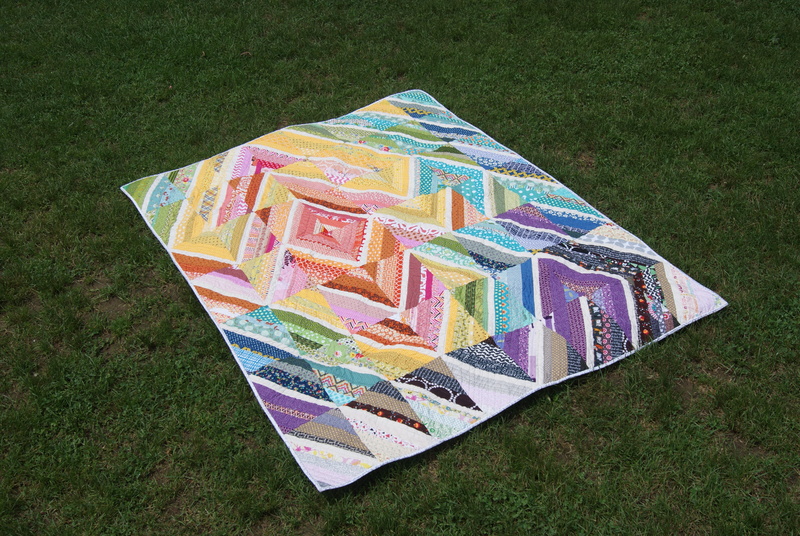 This is, coincidentally, another Elizabeth Hartman pattern, her Sparkle Punch quilt. I chose turquoises, light blues, tans, and browns to match my mom’s living room. I love this pattern. 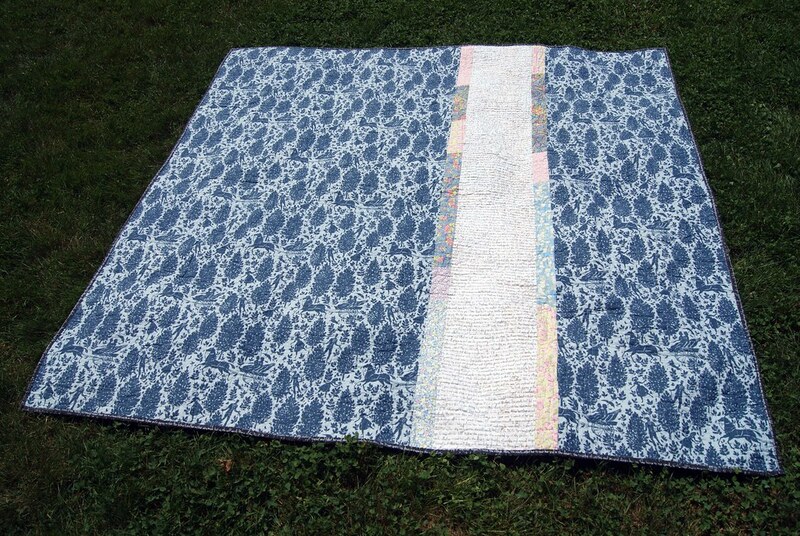 It’s a perfect marriage of traditional and modern, and I thought it was a way to make something for my very traditional mother while still expressing my own quilting style. 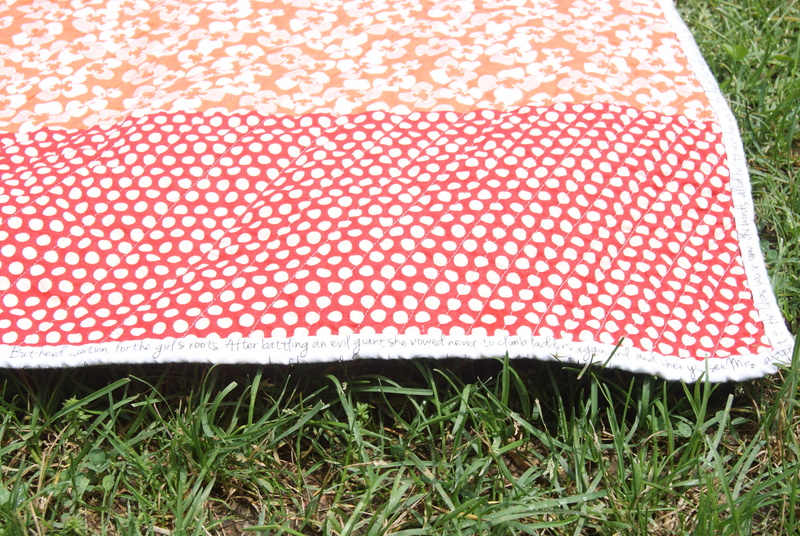 The backing is a Denyse print from Joann’s, that I picked up off the red dot rack for less than $4/yard (I know!). It’s perfect. I chose not to piece the back because I ran out of time because I thought that might be pushing it just a little too much on the modern quilting. You know. For my mom. The binding is that brown Posie print from Flea Market Fancy Legacy, and it’s all I can do not to go and buy like ten more yards of that stuff. Thoughts: When I went to take pictures of these (inside on a grey Massachusetts day, sorry sorry), I thought I knew which one I’d like to keep if I were being totally bad. 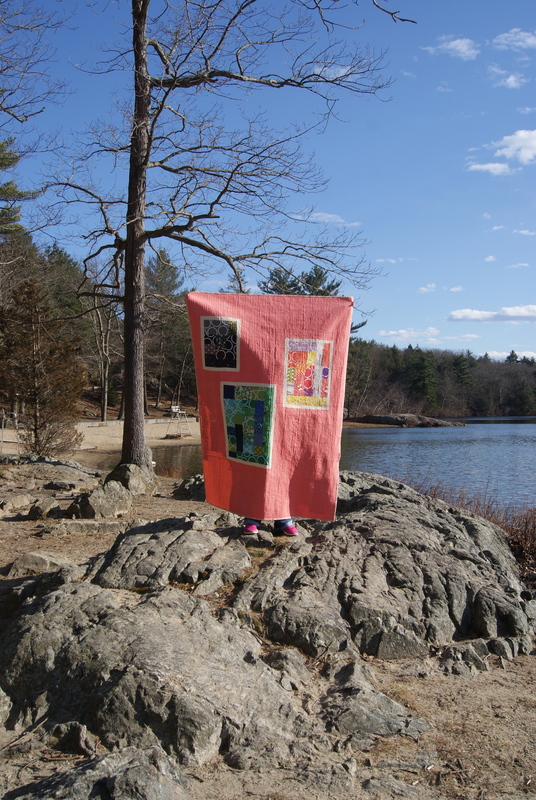 My heart, I thought, was totally with that Fire Drill quilt. But, as I spread out the Sparkle Punch quilt, I really appreciated the texture that the machine quilting created, and I found the color scheme soothing and easy to look at. Really, I love them both. Just like I love both my momma and my mother-in-law. 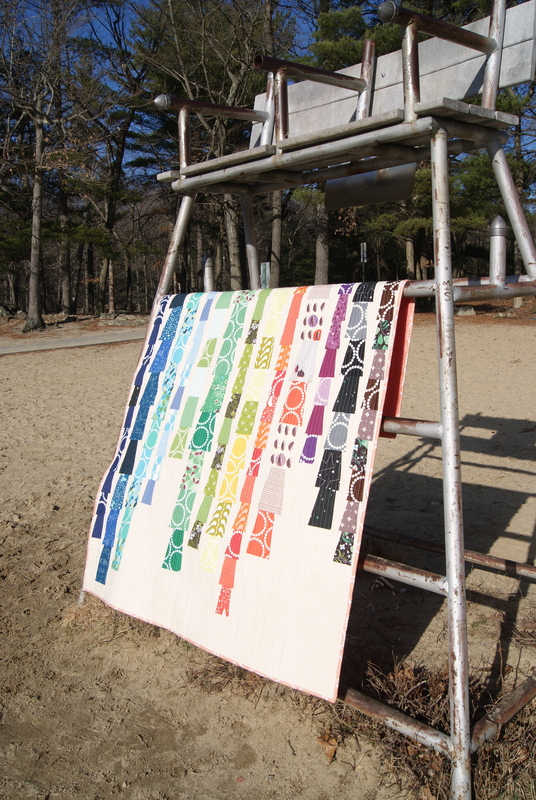 I hope these quilts are much-loved, too!